Sailing takes place each Wednesday morning and the competitors directly circularised. Occasional reports will be posted here to give a flavour to those who are interested. Those appearing tend to be the first Wednesday event of each month which for 2017/18 counted towards a trophy. A slight delay in starting this morning whilst Mike Ewart did a spot of buoy laying and shifting. Another great turnout of eleven boats today, to be greeted with a light southwesterly blowing this morning, leaving us with the decision as to whether to move to the spit or stay put in our normal position, in the end we tried to make the best of the wind without the walk so a simple two lap triangle course was set, firstly beating to red 1 in the eastern bay, followed by a run along the shore to red 5 followed by a shot reach across to red 7then back up to the windward mark. After a couple of frustrating races in very difficult conditions the decision was made to move, lock stock and barrel to where we should have been in the first place, not that conditions were much easier there, although it was at least possible to set a course in more or less clean air. Starting with a nice little beat out into the lake to round red 7 to port, a short reach to just off the spit, running into the channel, through a leeward gate, followed by a long and difficult beat back to the windward mark, straight back downwind, again through the gate for a short upwind finish. A+ rigs were the order of the day today, no awkward decisions to make, plenty of wind shifts and dead spots as we have come to expect with a wind anywhere from a westerly direction. The front of the fleet contained most of the usual suspects, with Keith Coxon managing the most race wins and after discards, nothing lower than third, leaving him the clear winner. Close on his heels was a very constant Rob Tottey, often the bridesmaid but today never the bride, however with nothing less than a third place after discards saw him just pip a very on form Bernard Bailey to second place. Alan Smedley, a race winner in race four again spent most of his time in the front half of the fleet, just edging Geoff Raygada, who was having a mixed day into fifth place. There were plenty of private battles lower down in the fleet and quite a few bumps, some more avoidable than others, and consequently plenty of turns done. Due to a few of the regular skippers being away away we were slightly down on numbers this morning with a turnout of 8 of the usual suspects. It really was one of the better sailing days at least as wind and weather was concerned, except that the North Easterly breeze carried a certain chill with it but at least it was nice and clean, blowing from across the lake. Strength wise it was towards the top of the A+ rig with occasional moments when some found themselves just a tad over canvassed, with the occasional nose dive and broach, but in the main, apart from a bit of a chop, which caused a few to stall on the tacks, it was just what we ordered. We started between the two inner white start buoys 1 & 3, first rounding red 7 to port, out to a spreader ( red 4 ) followed by a long run to red1, down in the bay. This worked pretty well but on the second lap, the beat from the bay to the windward mark was fetch-able in 1 tack, after a couple of races, we omitted the windward mark, forcing us further out to red 4, making a triangle sausage instead of two triangles. As per usual the wind had it's usual lifts and shifts to catch out the unwary and benefit those skippers that read them right, again both the inside and outside path upwind could be used, giving tactical choices although there was usually a sting in the tail at the windward mark, where more than one skipper made a fatal mistake, some of us on more than one occasion. Keith was again on his usual form although he allowed Geoff, John and Alex their moments of glory. Apart from the odd disastrous race, Richard sailed a fairly consistent set of races to take the third podium place behind Keith and Geoff. John Clifton arrived nice and early and said consistently well ending up just on Richard's heels and had it not been for a few stalls whilst tacking, there could well have been a change in positions. Despite a flying start, Alex just could not repeat his early form to just come home in front of Colin, who was having one of those days that mothers warn us about. Once again the salt and pepper pot came into play as we discussed tactics and rules in our clubhouse at the Old Beams over a pint and chips. Today's skippers were a wee bit thin on the ground since many of the regular skippers were away on holiday ( not together ) or circumnavigating the globe. Thanks to Rob Tottey for standing in and producing a report and results. "Start From the spit between White 5 & red 2 using the two outer reds as spreaders into white 4 then into Red 8 then out to red 2 back to White 4 (no spreader) then a run/reach to Red 6 in the channel then to the finish across the start line. Colin was on superb form, his boat tuned to perfection for the conditions. Wind shifts played their part today with first going to last and last to first - Red 8 in the bay caused everyone anxious moments again a good place to loose a race! Fair wind; good (well behaved) company and sunshine, what could be better. "Start between Red 2 and white 4 – out to white 5 off the spit Red 4 as a spreader then into Red 1 in the bay – back to white 5 sausage back to Red 1 and finish between the start line. Fickle wind from fair to nothing at times, mainly from the East with occasional gusts from anywhere – the windward mark proved tricky with wind affected by the Island. Races won and lost here. Now the 'best 7' scores are beginning to get filled in I though I would print out a 'how it's going' report on the monthly Wednesday Furzton Trophy for DF65 yachts. It shows how persistence pays - up to now anyway. Eleven skippers out today in almost perfect sailing conditions, with a stiff north easterly breeze , at the top end and occasionally a bit more of the A + rig, which was carried by all boats. Course wise, there hasn't been much change for the past few meetings, starting from the white start buoys to our left, with a triangle / sausage course, which took us to a windward buoy in the centre of our area, reaching to a spreader, out in front of the office block, then running to red 1 , in the bay by the western island. we repeated the up wind / downwind legs for the second lap, finishing between a couple of buoys just beyond the start line. There was some very good exciting racing with some very close finishes, especially in the final race where Alan Smedley and Geoff Raygada crossed the line so close that it was impossible to separate them, since nobody was exactly on the line, it could be either way since Geoff just caught a breeze at the final second as Alan just slowed after a tack, so a dead heat was declared. Mike Clifton came out on top again today but that's not to say that he had it easy with a couple of stalls at crucial moments. Very closely behind and sailing very well was Alan Smedley, with Geoff only a couple of points adrift, to occupy the third step of the podium. Other skippers worth noting today, some for the right reasons, others not. Firstly Brian Haith had a very good consistent day, sailing very well to a fourth place, without any hint of the gremlins that have troubled his boat over the last few weeks. Peter Wood had a mystery fault, which saw his boat drift into the bank, out of control. Colin Davies had a promising start, with some good positions, including a couple wins although a few less god finishes relegated his position. Today's race sheet has taken a bit to decipher and there are a few races where there are some non finishers, Hopefully all those who finished have been recorded. Several skippers were seen fiddling with their boats between races in an effort to find that elusive sweet spot, in what turned out to be quite tricky conditions, some of which was down to the chop on the water caused by a relatively un interrupted wind. What can I say about today's sailing and still keep it clean! Five hardy, or should that read foolhardy, skippers assembled in the car park and assessed the situation, not that it needed much assessing! In the end of the day, having driven to the lake we decided to sail , at least until sense prevailed, or the pub opened. At least the Met office had warned us in good time and they were spot to the minute. did I mention that it was wet, very wet, from start to finish, with the only redeeming factor being was that it was blowing on to our backs rather than straight into our faces, on the stiff southerly breeze. There was no difference of opinion over rig choice, this morning, with everyone opting for the B rig, which proved to be the right choice, especially during the 20 MPH gusts although the numerous lulls left us all becalmed , wondering where or when the next gust would hit and from which direction. A fairly simple course was set, starting between the two inner white start buoys just off the left hand jetty, reaching to red 7 , in the bay, which with only 5 skippers proved no problem, we then ran downwind to red 8,off the spit, making our way upwind via a couple of spreaders, which we repeated, finishing over the start/ finish line. Drama struck almost immediately with Brian's boat loosing control, but fortunately it came home safely. After a fiddle with the innards, Brian launched again for the second race, only to end up on the island. The rescue launch must have nudged it clear before it's self getting tangled in its line, but all ended well with the boat freeing itself and sailing straight back to the jetty... phew !! As the scores show, the racing was very close, with everybody taking at least 1 win as well as last places, nobody had it all their own way but Richard proved the most consistent, starting off especially well until he had a lean period, before getting his mojo back. The rest of us were within a single point at the end of 8 races, except for Brian, who sensibly retired to a nice warm home. After 8 races, it was not far off beer o 'clock, so the decision to head off for lunch was made. Round 6 of the Furzton Cup attracted seven skippers, numbers a little down this week , due in part to some of the regulars escaping the dismal British weather for a warmer climate. I suspect that the pessimistic weather forecast discouraged others. As it happened the weather gods held off their worst until we were safely in the pub although it was never anything but dull and dismal all morning, again making it difficult to see the boats and judge distances. Probably our worst wind direction, due south, blowing on our backs and fairly well stirred up by the houses behind and as for strength, it was pretty well as predicted, mid teens gusting to mid twenties. There was no real consensus on which rig to use, we saw A+, A and B sails , some out of choice and some because it was all they had brought with them. Rob Tottey was the sole B rig user, with the rest using a mixture of A and A+ . it was a difficult choice as the predicted increase in strength never really materialised, well not on any consistent basis, anyway, although there were plenty of squalls which flattened the fleet on occasions and it was just a matter of luck where you were when the squall hit, places lost as boats broached, often just as they reached the mark. Starts in a southerly wind are never ideal so we settled for a short reach to orange 7 in the western bay, from a port biased line between the two inner whites. From there we ran to orange 8, in the opposite bay, out to the middle buoy, opposite the office block, then a good beat back to the inner start mark, down wind again out to the middle followed by another tough beat to the line. All seemed to work ok, although the wind proved quite tricky to read, with plenty of shifts and lulls. Due to the close nature of one design racing , and the tricky and unpredictable conditions we had six different race winners today, most having their glory moment as well as disappointments. Today's most consistent skipper was Alan Smedley, who can usually be found around the front of the fleet, not far behind was Geoff Raygada after giving his boat a severe talking to after the first few races, with Rob Tottey close behind. Amazing how these little boats are so sensitive to sail trim, a few millimetres here and there, transforms a tortoise into a hare. One of the more unfortunate skippers today was Bernard Bailey, who showed us all a clean pair of heels on a couple of occasions, was robbed of a better placing when a collision at the distant mark left his mainsail fluttering free after the cord securing the clew to the boom broke, leaving him with a short drive around the lake to retrieve his boat. What a pleasant surprise to find the temperatures just nudging double figures, positive, as opposed to last week's negative temperatures, although in the sheltered bays there was still some evidence of ice, for round 4 of the Furzton cup. A small but select band started today, initially in calm westerly conditions, which just improved slightly as the morning proceeded giving us a lovely gentle sailing breeze by lunch time. No confusion today over rig choices, it was solid A+ weather, all morning, making for some close and exciting racing, with many place changes throughout. A simple triangle sausage course was set, similar to our usual ones which have been used with the recent westerly winds, initially beating from a port biased starting line, towards the western bay, running back along the shore to the leeward mark before an upwind leg to the buoy just off the jetty, via a spreader. Lap two omitted the spreader to finish between the two inner buoys between jetty and western island. After finding a huge wind shadow in the bay, subsequent races moved the whole course one buoy to the right, thus keeping us out of the worst of the wind shadow. A few port starters, sailing along the bank, narrowly escaped the starboard starters on most occasions but not all. There were the usual lifts, headers, and calm patches , all there to add some elements of interest to the proceedings, choose the wrong tack and you paid for it, right down to the last couple of yards. 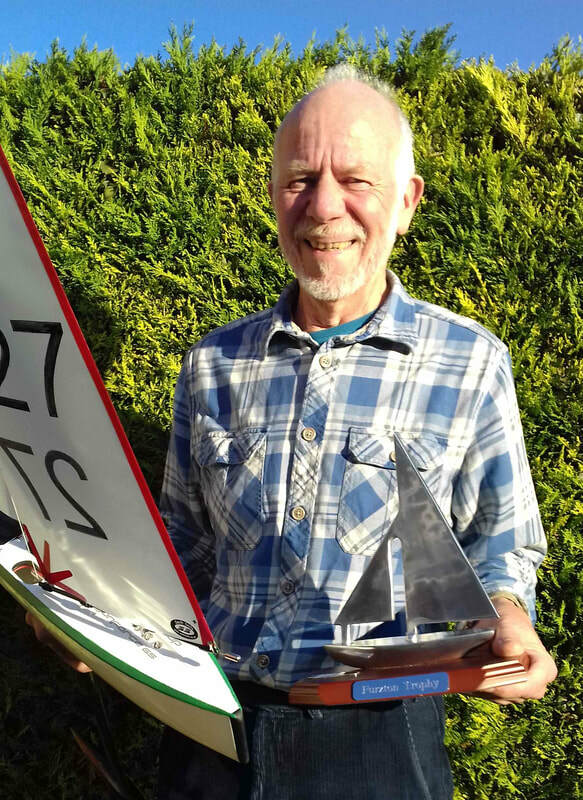 Three skippers shared the wins today with Keith Coxon taking four victories with Geoff Raygada and Alan Smedley, each with two first places apiece. The scores were very close today, with Keith just ahead of Alan, who had sailed extremely well but was hampered by gear failure at the end, leaving him with a DNF. Despite not winning a race, Richard just pipped Geoff by virtue of a string of good consistant finishes. The prospects of sailing today were always going to be slight but since I was half way to the lake I, thought that I would check. To my surprise the lake was indeed still liquid and with a nice easterly breeze and sunshine it was reminiscent of the weekend, which gave us some good sailing. Rob, Bernard and Alex arrived so the decision was taken to sail until the men in white coats came to take us away. A nice course was set, keeping us close to shore, nothing too ambitious, very similar to the weekend courses but utilising the eastern bay instead of going down to the spit, as we were sailing the little boats. All started well but one by one we dropped out, leaving Alex the only one to reach the finish line but only just. We all suffered the same fate, namely the wet sheets froze either to the decks or the fairleads so eventually the sheets unwound from the drums. At this point, common sense kicked in and we decided that it probably wasn't a sensible idea, sailing at -2 deg. The fears of a frozen pond were fortunately unfounded as despite the sub zero overnight temperatures, the breeze kept the water moving , not allowing any ice to form. A good winter turnout of ten well wrapped up skippers enjoyed a very pleasant morning's sailing in near perfect conditions. we had almost everything today, no mud, clear blue skies and uninterrupted sunshine, with the bonus of a fresh northerly breeze, which was just about the top end of the A+ rig. It was very cold but multiple layers meant that there were few complaints. The clean wind, from across the pond made course setting relatively easy, starting between orange buoy and the edge of the jetty gave us a good beat out into the lake, although the line had a definite starboard bias,then rounding the windward mark to port, returning to the easterly bay via a short reach to a spreader ( which became more of a beat on occasions). the second lap omitted the spreader, finishing with a close reach or beat across the line. Nobody had a clean sweep this morning, although Keith had some cracking starts and was usually first or second at the weather mark, from where he was almost uncatchable, whilst John Howell, who usually can be relied on to show us how it's done had a less consistent day than usual, struggling to get his boat trim correct and only managed a second place. Best of the rest, today was Richard Dolman, rarely far from the front. As usual the standard of sailing and rule observance was high with any infringement followed by a timely 360 ! The wind being towards the top end of the large rig did give some people sail setting problems , with incorrectly set boats wanting to round up into wind. The windward mark was somewhat of a "bunker" for most of us at some time or another, with distance perception causing a few of us to sail the wrong side of the mark on occasions, compounded by the fact that the buoy was directly ahead of us. In hindsight the far line of buoys are slightly too far out ( for old gentlemen ) and small boats, so they may well need moving inshore a few yards. If I had been writing the headlines, I might have started with something like "Killer storm causes havoc in Milton Keynes", but we all know to read these headlines with a decent pinch of salt. It would appear that the weather forecast put off all but the keenest skippers who were treated to an interesting, to say the least , morning's sailing. Keen as ever Bernard was the second to arrive but sadly, as it would turn out, in his eagerness to get there he had forgotten to pack his transmitter and since nobody had a spare compatible hand set he made a double journey arriving in time for the last couple of races. Another early casualty was Colin Davies, who suffered terminal winch problems during the first race and not wishing to delve int the innards of his boat in the blustery conditions, settled for spectating and joining us in the pub. Everybody else managed to complete every race although my boat did suffer a gooseneck coming loose, which made sail setting impossible and went undiagnosed until the last race. Did I say It was windy? Well it was a Westerly at the very top of B rig and at times well into C rig territory, especially during some of the frequent squalls which wiped us all out at one time or another. Tacking was sometimes an issue, so gybing was often the only way round and in order to keep things as safe as possible, we opted to keep fairly close to the bank by starting between the edge of the jetty and orange buoy just beyond, followed by a very tricky beat out to orange 7, in the channel, through which the wind was funnelled, followed by a hairy run down to the orange buoy in the eastern bay, beating back via a spreader. The final lap took us back to the spreader , finishing across the start/ finish line, which despite its simplicity, provided enough of a challenge to allow for some last minute or indeed second place changes and at least one silly mistake. The trick today was not to venture too far out and to time your tacks, oh yes at all costs to avoid trouble and if you could master that lot you would be in the position that Rob Tottey found himself. His boat was well trimmed and it is obvious that all his practice has been paying dividends ,so sailing more or less in control, more often than the rest of us as well as getting some good starts meant that he was today's worthy winner. Having a slightly frustrating morning, runner up Geoff Raygada, struggled with sail setup after a good start in the first few races, Richard Dolman also struggled to get a decent setup but eventually found the sweet spot after the third race. In summary, it would be fair to say we had a good challenging morning's sport and a nice cosy lunch in the pub which we had almost to ourselves. Round 2 Furzton Cup, Wednesday 6th December. Being the first Wednesday of the month, today saw round 2 of the Furzton Cup, our new competition for the weekday skippers, with eleven skippers competing today. The forecast wind never really materialised so initally the choice being between A and A+ rigs, with a few opting for the larger rig leaving the majority of the fleet choosing the more conservative option but after a couple of races, as the wind strengthened slightly Geoff opted to change to the more controllable smaller rig although to be fair a few held on and managed well, if a little over canvassed. The south westerly breeze, as usual was badly affected by the houses and trees making the westerly bay a no go area and the island cast a large wind shadow over a large area of the lake, which needed to be taken into account on the two upwind legs. Ideally we should have been sailing from the spit but we made do with a short upwind leg from the two buoys in front of the sailing area to the buoy just off the left hand jetty, taken to port, running parallel to the bank, rounding again to port, out into the middle buoy, in line with the hotel, followed by a beat back towards the inner start buoy, back out before and up wind finish between the left hand jetty and the centre buoy of the trio... easier done than described. Despite the start line being heavily port biased and the short beat to the windward mark, turned into more of a close reach, most people managed without too many incidents. The racing again was dominated by Keith Coxon , with six out of nine wins , the next of the best was a close call between Alan Smedley and Geoff Raygada, with Alan winning out on count back, although the results for GR were missed off the sheet and so an average score was taken. The two upwind legs gave plenty of opportunity to make up or loose places, with plenty of shifts to catch out the unwary. Running out to the far buoy was challenging with a few incidents due to eyesight problems and beating directly back towards ourselves. was equally tricky. As usual competition throughout the whole fleet was keen, with some good sailing from our new members and on the whole rule observance was good, penalty turns being taken, although one incident did generate some heated debate, not interpretation of the rule mealy one of judgement of overlap and clear ahead. Never mind it gave Mike Ewart ample opportunity for a rules seminar over lunch, using several pieces of cutlery to demonstrate, all very illuminating. Only Alan Smedley, Rob Tottey and Colin Davies returned in the afternoon to sail the 95's, so no results today. Some early bedtime reading for you all ! A lovely day for the beginning of November, bright and not too cold , but that was probably because of the very light westerly wind. As usual this direction caused a few course setting issues with an initial course that took us into the westerly bay then running close to shore midway down the lake, with a spreader further off shore out of the wind shadow, followed by a second lap, missing out the spreader. All buoys were port roundings in order to keep things nice and simple, which meant that there weren't too many incidents around the marks except when the fickle wind died, causing some bunching and boats with no steerage being caught out, unable to manoeuvre clear. The line had a definite port bias, for most of the races, so port starters, close to the shore had an advantage, provided they avoided trouble. As usual there were channels in the wind, which the wise used to good effect, however lady luck came into play when the expected breeze had shifted, leaving boats sailing in treacle, whilst the fleet sailed by. After three races, the start line and the whole course was shifted East, thus avoiding the sheltered bay, making sailing more pleasant and less frustrating. Again it was good to see a great turnout of thirteen boats, despite some of the regulars being away and once more the racing was very close, although some races saw the back markers a good couple of legs behind the winners. Competition at the front of the fleet was keen with three skippers scoring two wins, apiece with Alan Smedley and Richard Dolman also leading the fleet home, nobody was feeling safe until they were actually called across the line since places changed within spitting distance of the finish. John Clifton took advantage of the unseasonably warm conditions to join us and sailed his usual consistent self, being a bit of a master of the light tricky conditions, albeit with a couple of minor hiccups, like the rest of us. Mike Ewart seemed to be getting his RG65 to perform better than last week but I think that whereas at one time an RG 65 would romp away, they are now at a disadvantage against a DF65 with the larger A+ rig, especially in light tricky weather. With eight races completed by 12:00 o'clock, it was off to the Old Beams, which is steadily getting busier as Christmas approaches. No formal DF95 racing, this afternoon as many of us had things to do in the afternoon, however a few returned for some casual sailing after lunch.